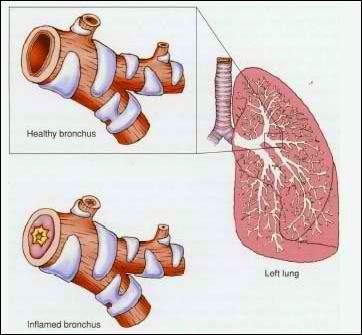 Bronchitis is an inflammation of the lining of your bronchial tubes, which carry air to and from your lungs. When a person has bronchitis, it may be harder for air to pass in and out of the lungs. People who have bronchitis often cough up thickened mucus, which can be discolored. Bronchitis may be either acute or chronic. Often developing from a cold or other respiratory infection, acute bronchitis is very common. Chronic bronchitis, a more serious condition, is a constant irritation or inflammation of the lining of the bronchial tubes.